The year-long Resilient By Design | Bay Area Challenge ideas competition has sought to utilize community-led ecological design to “develop innovative solutions that will strengthen [the Bay Area’s] resilience to sea level rise, severe storms, flooding, and earthquakes.” Last week, the nine teams working with local communities and organizations on the competition unveiled final proposals for a collection of sites scattered around the San Francisco Bay. The nine sites represent a collection of some of the most ecologically fragile areas in the region, places that may see dramatic change in coming decades as climate change takes hold. The initiative seeks to begin to reposition these areas—some are densely-populated while others host vital regional infrastructure—for a climate change-addled future. For the competition, design teams led by Bjarke Ingels Group (BIG), James Corner Field Operations (JCFO), Tom Leader Studio (TLS) and others pursue efforts to restore regional wetlands and riparian floodplains while reorienting infrastructural investments and development to suit these new landscapes. 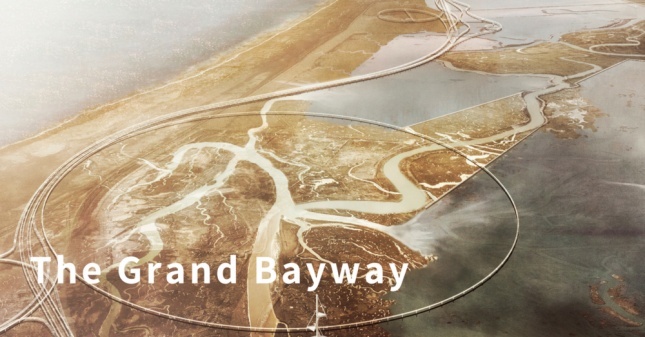 The Common Ground team led by TLS Landscape Architecture proposes to extend Highway 37 across San Pablo Bay by designing an elevated scenic causeway that would allow riparian landscapes to flow beneath the new multi-modal artery. The team proposes to deploy the causeway with flair by breaking out various lanes of travel into whispy overpasses that thread through the landscape including a grand, “mobility loop” encircling rich recreational areas. 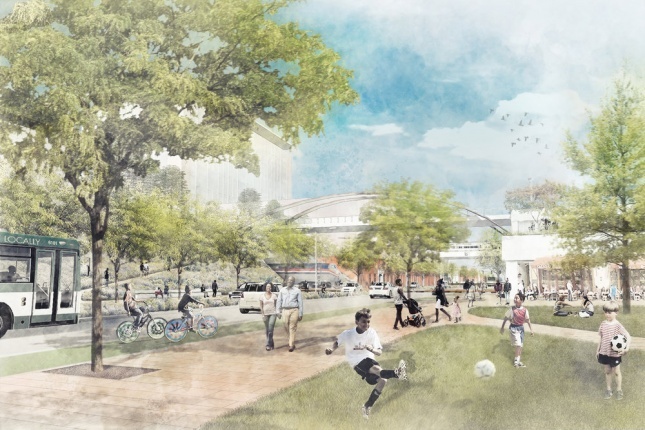 The design team is made up of Exploratorium, Guy Nordenson & Assoc., Michael Maltzan Architecture, HR&A Advisors, Sitelab Urban Studio, Lotus Water, Rana Creek, Dr. John Oliver, Richard Hindle, UC Berkeley, and Fehr & Peers Transportation Consultants. 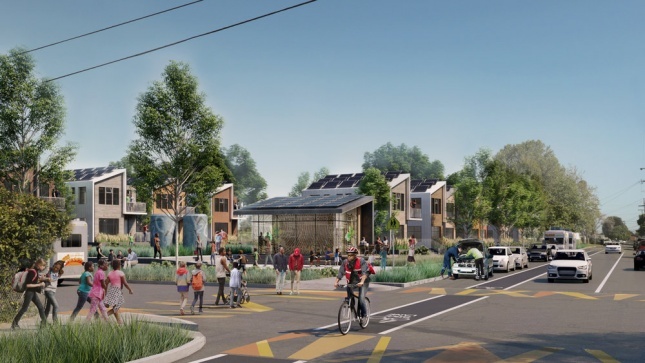 The ouR-HOME project proposes to deploy a package of land-use reforms to incentivize small lot housing, community land trusts, social impact bonds, and new community infrastructure to prepare the community of North Richmond for climate change. The proposal calls for the construction of a new “horizontal levee” around the city that will protect it from potentially toxic runoff that could emanate from a nearby gasoline refinery during a flood. The vision also calls for planting 20,000 new trees to help “bring the marsh to Main Street,” an effort that aims to preserve and build upon existing community wealth in the majority African American and Latino enclave. The team is led by San Francisco-based architecture firm Mithun and includes the Chinatown Community Development Center, ISEEED/Streetwyze, BioHabitats, Integral Group, HR&A Advisors, Moffat & Nichol, ALTA Planning, Urban Biofilter, and Resilient Design Institute. The Estuary Commons plan creates a new network of ecologically-focused public spaces along areas surrounding the estuaries of San Leandro Bay in Alameda County. The proposal calls for investments in bicycle greenways, secondary housing units, and inclusionary zoning reforms in order to “build resiliency within the community.” The social and environmental justice-focused bid also calls for burying a stretch of Interstate-880 running through Downtown Oakland in order to remedy past planning errors. The All Bay Collective—made up of AECOM, CMG Landscape Architecture, University of California, Berkeley- College of Environmental Design, Berkeley Center for New Media, The Terner Center, California College of the Arts, IDEO, Silvestrum, SKEO, modem, and David Baker Architects— is behind the scheme. 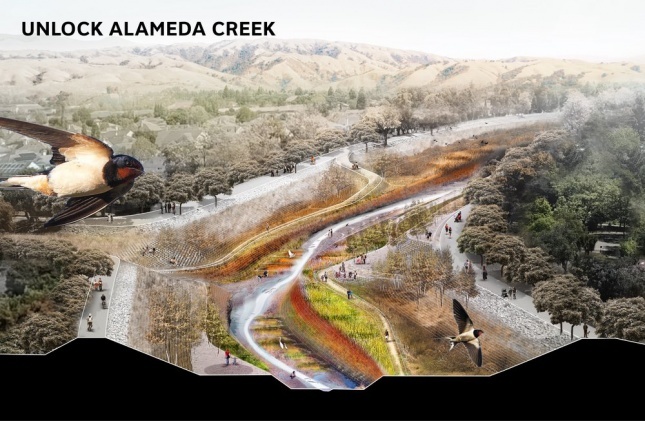 The Public Sediment for Alameda Creek plan calls for reconnecting sediment flows between Alameda Creek and the bay’s wetlands in order to create a natural and ecologically-rich defense against floodwaters. The scheme revisions the currently-static flood control channels that criss-cross the southwestern edge of the Bay into redesigned estuaries, sediment traps, and berms that facilitate the build up of sediment while still allowing for public use and natural habitats. The team is led by SCAPE Landscape Architecture and also includes Arcadis, Dredge Research Collaborative, TS Studio, UC Davis Department of Human Ecology and Design, UC Davis Center for Watershed Sciences, and Buoyant Ecologies Lab. The South Bay Sponge proposal aims to use a mix of cut-and-fill excavations and zoning swaps to build densely on high ground along the southern edge of the Bay in San Mateo and Santa Clara counties. 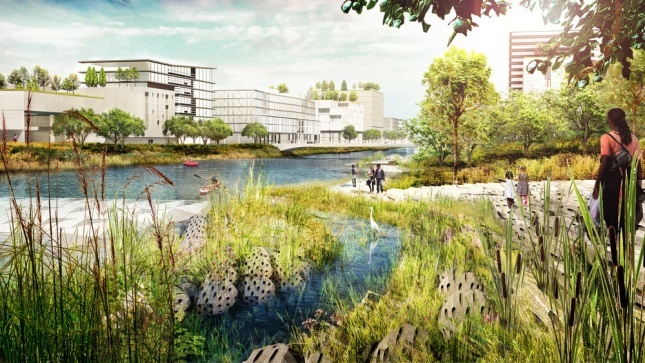 The plan would create networks of “sponge” landscapes that absorb tidal flows and run off, efforts that would involve reorganizing urban fabric in these areas into dense nodes of habitation surrounded by water-friendly landscapes. The design team behind the proposal includes JCFO, Moffatt & Nichol, Magnusson Klemencic Associates, SF BAY National Estuarine Research Reserve, Romberg-Tiburon Center, SFSF, Andrea Baker Consulting, James Lima Planning + Development, The Bay Institute, SeArc / ECOncrete, HT Harvey and Associates, Playhou.se, and Adventure Pictures. 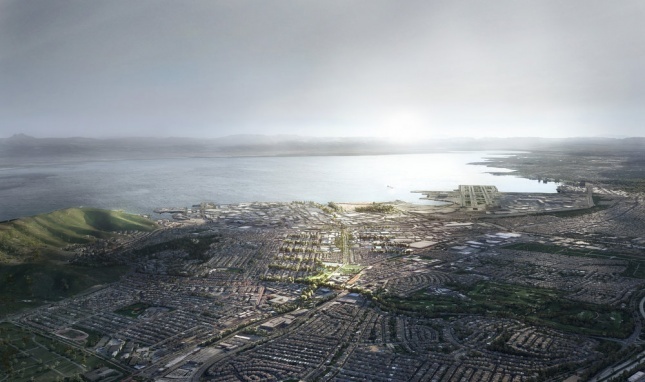 The Hassell+ team proposes to create additional public green space and a continuous public access route along South San Francisco’s Colma Creek that would double as storm surge-absorbing infrastructure. The plan aims to reduce the impacts of flooding by utilizing a network of greenways and municipal parks to restore native ecologies. These areas would manage runoff from existing neighborhoods, creating new public open spaces along the way. The plan would revamp the city’s urban waterfront and make restorative alterations to Orange Memorial Park. The project team includes Lotus Water, Civic Edge, HATCH, Brown & Caldwell, Idyllist, and Page & Turnbull. The design team also includes Moffat & Nichol, Nelson Nygaard, Strategic Economics, The Dutra Group, and Stanford University. The Permaculture and Social Equity Team is proposing to utilize social design as a way of building a vision for Marin City, a diverse working class enclave located just north of San Francisco. The team’s social design project involved extensive community engagement and is focused on equity, placemaking, and public ownership. The team is made up of Pandora Thomas, Antonio Roman-Alcala , the Urban Permaculture Institute, Ross Martin Design, Alexander J. Felson, and Yale School of Architecture. 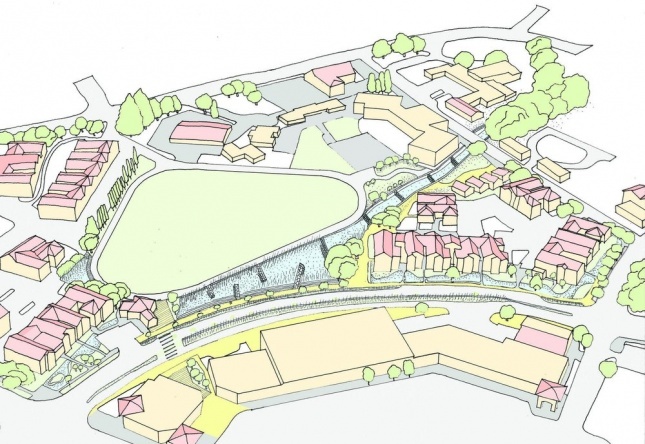 The Elevate San Rafael plan put forth by the Bionic team that proposes to reorganize the small city of San Rafael, pulling in its edges from flood-prone shorelines while building up higher elevations with dense housing and public infrastructure. 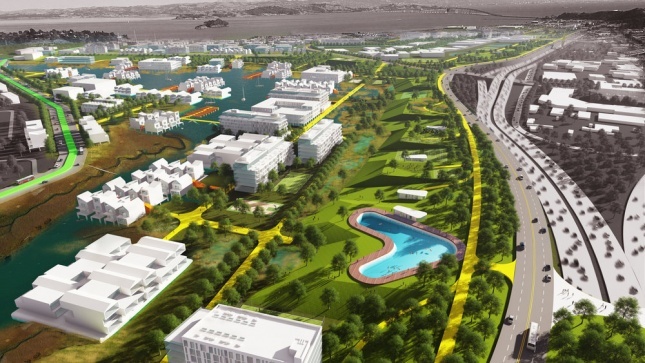 The proposal would repurpose underutilized lots into flood planes flanked with housing, add floating recreational islands within the bay, and build up artificial reefs along the bay floor. 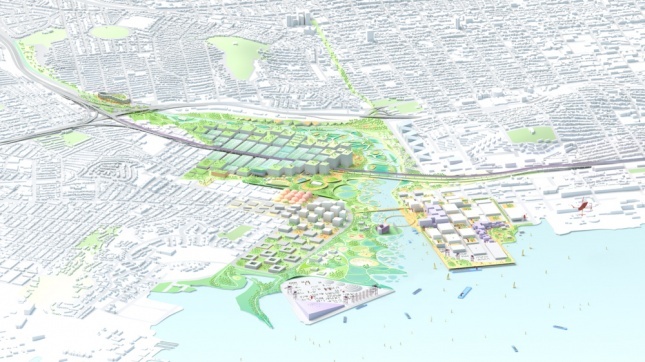 The plan proposes to pair “time-tested approaches to coastal adaptation with a moral, financial, and infrastructural agenda” as a way of adequately planning for the city’s future. The team is made up of landscape architects Bionic, WXY, PennDesign, Michael Yarne, Enterprise, Moffatt & Nichol, WRA, RMA, SF State, Baycat, Studio for Urban Projects, RAD Urban, and KMA. For more information on the proposals, see the Resilient By Design Bay Area Challenge website.